The switch location and loosening is very interesting, thanks Olivier. I wish I had a better handle on the design/construction of the stages and how the limit switch(es) relate to all this; what exactly does “unscrewing the switch a little bit” do? Not clear (tho I’ll look at this more closely and see if I fully understand it better on my machine). Since you didn’t literally remove the two switch mounting screws altogether, I take it the switch remains in nominally the same position in the stage, yes? Does loosening it just basically allow the stage to go ‘a little farther down’ compared to if the screws were tight? Olivier, —wow. I’m not sure I’m totally following this, but, your note about loosening those two Phillips screws that, from what I can tell, basically causes the Z limit switch to “sag” down a mm or two, TOTALLY changes the Z stage behavior! I was immediately able to perform the full bed-leveling calibration process, and appear to be able to finally move on to, you know, USING the machine! Have other users been down this screwy (no pun intended) road of loosening that switch?? I don’t know about you, but I’m potentially inclined to simply the switch in this condition—I mean, why not? One could even “stabilize” it in this admittedly rather precarious condition, via some judiciously applied epoxy (I do a lot of that sort of thing in my real life; laser/photonics R&D…). No, I don’t appear to be able to download and use the update.bin v2.8 file; my machine immediately blinks fast, only (i.e. no slow blink for 5 s), and in “About” I still see v2.4 on the display. The provided USB stick is FAT32 no problem and the .bin file is in the root directory, and seems to be working fine as far as I can tell. Hi bean, sorry, but I can’t read your reply due to my (lack of) non-English language skills. Can you reply in English if possible? Thanks. I received our purchased printer this week. And i am having the same problems. The z-axis will only go up and not down when using the “home axis” function. I have swapped the Y-axis with the Z-axis to see if it was a hardware problem. This was not the case. So i leaned towards a software problem. My printer came with a 2.4 version and downloaded the 2.7 from the website. When using the usb-stick delivered with the printer i was not able to update the firmware. This however did not fix the Z-axis problem. Than i came across this forum-topic. Loosen up the z-axis limit sensor did not make sense to me. I tried anyway, but no luck for me. Than i pushed it a bit inwards while pressing the “homing axis” function. Than i managed to get the z-axis down for the first time. This made me able to calibrate the machine. But after power-cycle the printer, it had the same problems again. 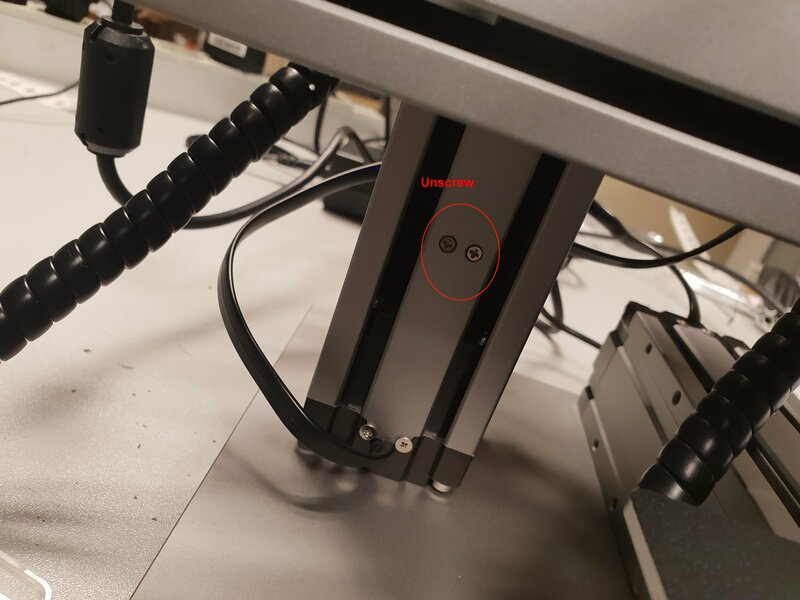 What i think is going on, is that the sensor is very sensitive and due to the movement of the x-axis the z-axis sensor is triggered. Meaning it won’t go down. I am not sure about this, but loosen up the sensor gives the sensor a bit of room to wiggle. However, i still find it strange that when swapping axis, the problem only occurs on the z-axis. I am looking forward to a solution, to fix this bug on a brand new printer. As Bill Clinton once said, “I feel your pain…” Well, loosening up my machine’s Z-stage’s lower limit switch (maybe the only limit switch? Not sure it’s actually got one in the upper end of it, since you can get the thing to where it ‘clatters’ up at the top end, i.e., trying to go up higher but simply can’t mechanically) is how I’ve still got my machine set up, and it does indeed result in bed-leveling cal ok and basically everything else about the machine, ‘working right’…but it’s not satisfying to leave it like that, that’s for sure. I’ve confirmed really decent leveling/cal, and printed several basic little parts that all turned out pretty good (now I’m into the wide world of getting PLA to stick to the bed well, and all that). I sent Sean Li a follow-up a week or so ago, and noted how I sure don’t want to have to leave my brand-new machine in this ‘loosened-up Z switch’ condition and whether it’s time to start talking about sending this unit back, but I haven’t heard back from him on that so far. I haven’t had any luck updating firmware, still stuck at ver2.4 I believe. I may try a different stick like you did. That is certainly interesting that your successfully upgrading to 2.7 (i.e., your touchpad actually says “ver2.7” on it in the “About” page, now, yes?) didn’t fix this Z problem, as (from what I can gather) its main purpose is to do that…thinking a bit more just now, I wonder if it’s just basically a subtle but show-stopping issue with the thin steel ‘lever’ at the top of the switch, simply needing to be ‘tweeked’ (bent) downward a mm or two—eh? (that is, with it back in ‘tightened screws’ condition, as it should be) I may look into that this weekend, now that I think of it. Yep, I swapped two stages, too, and the bad behavior (pre ‘switch loosening’) was identical on the ‘new’ Z stage. Short update; I successfully updated firmware to 2.7, using a different USB stick (tho maybe I was just goofing up with the SM-provided stick earlier, not totally sure). Since my Z limit switch is still loose (the machine is working so well with it loose, I’m a little hesitant to change anything about the switch…), I’m not sure if that firmware update affected the Z axis homing issue or not. Anyhow, printing up a storm now (I’m currently in “everything looks like a lens cap” mode here, ha) and enjoying it immensely. I’d note that I’ve already got a lathe and a mill, full home shop, etc, but am finding myself enjoying the whole mini-CAD/CAM experience re: Solidworks>SMjs at the kitchen table! Good to hear you have successfully updated your firmware. Mine indeed now says 2.7 on the display. For me this temporary solution is not working. Once i have powered down the printer, and i want to use the printer the next day, the printer is not homing as it should. I am in contact with my supplier, and will give you an update when things have improved. This has fixed my z-axis homing problem. The only problem i now have is that the y-axis (heated bed) does not move to its zero point when starting a new printjob. Temporary fix is to do a manual homing action. Than i am good to go for a new printjob. So just got my Snapmaker and had the same issues described above. I fumbled for a while but was able to get everything working. A few consolidated notes for those having these issues. Before the firmware update to 2.7 and 2.8, i was not not able to print like i do now with 2.8. I only noticed when i had installed 2.8 that the y-axis is having this issue with not homing with a new print job. A simple work around is to do a manual homing after you turn on the printer. I noticed that even with the manual homing, sometime the y-axis doesn’t want to move in the correct direction. I have to do a 2nd homing action before it goes back to its 0 position. BTW. I was able to use the delivered USB stick eventually when i reformatted with FAT32. But i have reset the cluster size to default before i clicked format. I have already supplied detailed videos and step by step procedures via my local supplier. If there are any updates on that i will comment here as well. There is definitely some funkiness with 2.8. when I go to jog controls, it randomly moves axis around. I also had an issue where after canceling a print, it seems to be confused and when homing, the y axes kept creeping backwards. a power reset fixed that issue. Definitely some bugs in 2.8, but at least the printer is usable.